TRP channels are a large family (about 28 genes) of plasma membrane, non-selective cationic channels that are either specifically or ubiquitously expressed in excitable and non-excitable cells. The TRP channels have six putative transmembrane domains (TM) with a pore domain between the fifth and the sixth TM, and all assemble as tetramers. Both the N- and the C-terminus of all TRPs are intracellular. According to IUPHAR, the TRP family is composed of three main subfamilies on the basis of sequence homology; TRPC, TRPM and TRPV (to date, three additiol subfamilies are also considered to belong to the TRP family: the TRPA, TRPML, and TRPP). The TRPV subfamily consists of six members, TRPV1-6. Four members of the TRPV family have been described as a thermosensitive ion channels (TRPV1 to TRPV4). Each channel exhibits distinct thermal activation thresholds ranging from noxious cold (<17Â°C) to noxious heat (>52Â°C). TRPV3 is highly expressed in skin keratinocytes. It forms a nonselective cation channel that is activated by hot temperatures in the innocuous and noxious range. The channel is also expressed in oral and sal cavities where it has been postulated to play a role in flavor sensation. TRPV3 is also implicated as a molecular target of some allergens and skin sensitizers. 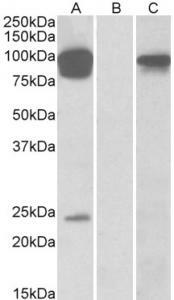 Western blot analysis of TRPV3 expression in HeLa (A); SHSY5Y (B) whole cell lysates. HEK293 lysate (10ug protein in RIPA buffer) overexpressing Human TRPV3 with DDK (FLAG) tag probed with TA311578 (0.5ug/ml) in Lane A and probed with anti-DDK Tag (1:10,000, Cat# TA50011-100) in Lane C. Mock-transfected HEK293 probed with TA311578 (1mg/ml) in Lane B. Primary incubations were for 1 hour. Detected by chemiluminescence. 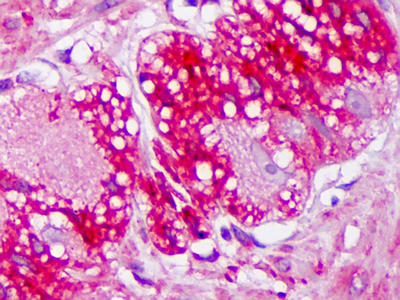 Anti-TRPV3 antibody IHC of human colon, ganglion. Immunohistochemistry of formalin-fixed, paraffin-embedded tissue after heat-induced antigen retrieval. Antibody concentration 10 ug/ml. Western blot analysis of rat DRG (lanes 1 and 2) and rat brain (lanes 3 and 4) lysates: 1, 3. Anti-TRPV3 (extracellular) antibody, (1:200). 2, 4. Anti-TRPV3 (extracellular) antibody, preincubated with the control peptide antigen. IHC staining of mouse spinal cord using Anti-TRPV3 (extracellular) antibody. A. TRPV3 (green) appears in neurons (vertical arrows) in the ventral horn of the mouse spinal cord. B. Motor neurons were stained with goat anti choline-acetyltransferase (red). In some motor neurons (A) TRPV3 was more intense (vertical arrow) whereas in others it was weak (horizontal arrows). C. Merged images of panels A and B. The inset in C magnifies one large motor neuron (vertical arrowhead). Expression of TRPV3 in rat DRG primary culture. 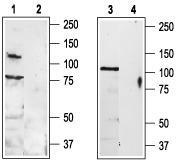 Immunocytochemical staining of living rat dorsal root ganglion (DRG) primary culture using Anti-TRPV3 (extracellular) antibody, (1:50-1:100), followed by goat anti-rabbit-AlexaFluor-555 secondary antibody (A). B. Nuclear staining with the cell-permeable dye Hoechst 33342. C. Merged image of panels A and B.